Montessori Candy: Sponsor News & Fabulous Montessori Candy! Sponsor News & Fabulous Montessori Candy! I'll be taking a little time off from blogging during Holy Week and Easter to spend time with the family. Before things slow down around here, I'd like to share a few items of note from my sponsors. 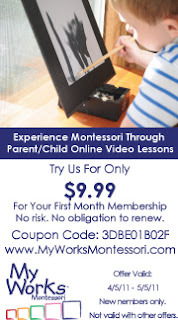 My Works Montessori is offering a special deal to Montessori Candy readers during the month of April. Check it out! Needing a special gift with the true meaning of Easter? Check out Catholic Child Catalog's great books, CD's, DVD's and more under their Lent and Easter Category! I've been really interested in learning more about the Montessori method for ages 0-3 lately. Let me know if you've got any good suggestions for reading or blog posts! I noticed Montessori Education Supplies has a nice selection of toddler items. 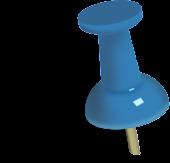 Do any of you use these items in the home? Finally, have you seen what Jennifer has been doing with Montessori Print Shop lately? Three words describe it: Oh, my, goodness! Seriously, Jennifer has done an amazing job at sharing some wonderful resources and information for all of us! You have got to check out her blog post to see all the new stuff she's been so generous to share. My favorites are the "How to" and "Scope and Sequence" sections. I really just cannot say enough about how much great info she is providing. I just love it! Jennifer has got the Montessori Candy and she is handing it out like it's Halloween! You go girl! Go ahead and check it out! Montessori Print Shop 3-Part Card Storage. Picture Copyright Montessori Print Shop. I have a 2 yr old and an 8 month old and follow our Montessori journey through my blog at imateachingmom.blogspot.com if you are looking for Montessori from birth to 2+. Love your blog!